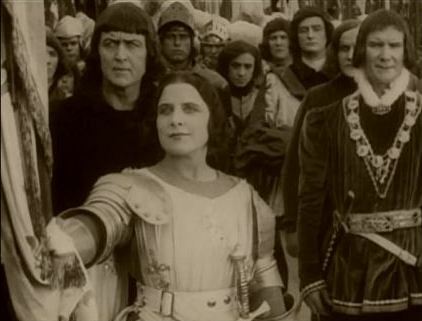 I'm introducing a screening of Cecil B. DeMille's 1927 film The King of Kings next month, so I thought now would be a good time to finally watch DeMille's take on Joan of Arc - whilst not a biblical narrative, certainly a story that, in popular culture terms at least, is a very close neighbour. The film stars Geraldine Farrar, an opera star who Jesse Lasky poached for the Jesse L. Lasky Feature Play Company by offering her an exorbitant salary (Higham 49). Farrar is hardly the young teenager that Joan was, but she is otherwise good in the role, not least because her own star power gives an extra element to Joan's meteoric rise. It's a while before Farrar gets to appear on screen however because the main part of the film is bracketed by some scenes from the trenches of WW1 - then a current conflict. This seems certainly like a response to Griffith's Intolerance, also Fritizi Kramer of Movies Silently (read her review of this film here) that amongst the reasons this was added was because screenwriter Jeanie Macpherson insisted on it in order to give the film "a more upbeat ending". I can imagine though that it would also reflect DeMille's concerns about the Great War and certainly this comes across as very much pro-France film with the French forces needing to repel the invading forces in their country. Of course as I'm looking for connections with The King of Kings then this link to a film that features Jesus cannot be ignored. It'd be interesting to know (and I will probably read up on this in DeMille's autobiography shortly) to hat extent Griffith's work influenced DeMille. Joan was his first historical epic. From today's perspective that is surprising for his name is now synonymous with the genre. On the other hand however DeMille seems to critique Griffith's film, most notably in the scenes towards the end of the film when a series of men wearing white robes and hoods. It's an interesting way to link the KKK and the Borriquita brotherhood in nearby Spain. Their role as leading persecutors of DeMille's heroine certainly reflects badly on them and seems to be a rebuke to Griffith's Birth of a Nation (1915). Perhaps the film's most significant contribution is the use of colour, most notably the Handschiegl Color Process (aka "Wyckoff-DeMille Process") for certain scenes Most notably Joan burning at the stake. DeMille pioneered colour a few times, and it's curious that whereas he used it for Joan's death, he uses another pioneering colour technique for Jesus' resurrection in The King of Kings. (In the earliest cut of the film he also uses colour for the opening sequence of a vampy Mary Magdalene and her lovers). It's very effective here, partly due to its limited use. There are some good screen grabs of it here. Aside from the use of the Handschiegl Color Process, there is also the widespread use of tinting and toning throughout the film which DeMille uses to good effect. One memorable image is of the red tint that accompanies Joan's vision and calling. Here, as with many places in the film, DeMille uses double exposure to add an element of the supernatural here with the appearance of a cross. He uses this technique quite extensively through the film and to be honest overuses the double exposures, for a technique that had been in use since the turn of the century it seems a little odd that DeMille is so enamoured by it. Again though this reminds me of DeMille's use of double exposure - or more to the point multiple exposure in the scene where Jesus casts seven demons our of Mary Magdalene. Lastly I just wanted to touch on the way DeMille and MacPherson use quotes from the Gospel accounts of Jesus' death. Two in particular stand out, notably when Joan herself asks why God has foresaken her, and then later, when she is on her way to the stake (and there is a very Golgotha-y feel to the way a procession leads her to the stake) when one of those who gave false testimony against her, and was even involved in torturing her, asks for her forgiveness because they "knew not what they did". In many ways this actually recalls DeMille's The Ten Commandments (1956) more than The King of Kings (though it is perhaps the "middle term"). Through that film DeMille and screenwriter Aeneas MacKenzie draw out numerous parallels between Moses and Jesus often reversing the very ones the gospel writers put in to do the same. Here again we see this, not only in the use of these two lines to verbally create the parallels but also in variopus bits of imagery and composition. As a film I must admit it didn't really grab me. Whilst some of the imagery is rather fine, particularly on a bigger screen, a lot of it had too much going on. In particular the Battle of Oreans was long and a little dull. DeMille clearly hadn't quite perfected his eye for the small details against the largest of backdrops and the composition looks cramped. It's one of the longest scenes in the film and it feels like the time and money invested it could have gone elsewhere. That's all for now on this film - this is a scribbling down of a few thoughts, rather than a proper review as such, but hopefully it will be of interest to some. Higham, Charles "Cecil B. DeMille, an Uncensored Biography". (New York: Charles Scribner's Sons, 1973).